Fix up your face from dawn til dusk with this fab new cover up…Multi-tasking just got extra pretty, with Max Factor‘s brand spanking new Facefinity All day Flawless 3 in 1 Foundation. This foundation has to be one of the most easiest to apply foundations that i have ever used,it literally glides onto skin and blends amazingly easily. It covered well and the colour was perfect. However at the end of the day it needed to be touched up so the longevity may not be as good as some foundations but it is perfect as a stop gap until you can but your usual expensive foundation. 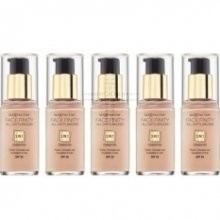 Max Factor is a brand that I don't often use, but this foundation provides excellent coverage with a soft, velvety finish. The slightly powdery consistency makes it very blendable. Good coverage, but feels light on the skin. Light reflective. Long-lasting. Can start to dry out throughout the day, so might not be suitable for very dry skin. A light, easy to apply foundation that covers well. Not suitable for very dry skin. This product is fab, saves fiddling with primer, concealer. Just apply this (I normally use Max Factor creme puff to seal my make-up)and you're ready to go. This hides spots, blotches, red marks/thread veins. If you're looking for a new quick fix make-up get this. (It was selling in Superdrug last week (w/c 22.10.12) for £8.99 - normally £11.99 whichever way it's still a great price for such a fab product. It could probably outdo a lot of premium make-up brands. "This foundation has to be one of the most easiest to apply foundations that i have ever used,it literally glides onto skin and blends amazingly..."